Kent Design and Development Awards- Winners Announced! The finalists of the Kent Design and Development Awards have been announced. The awards, which have been jointly organised and sponsored by DHA Planning, Kent County Council and Ward Homes, celebrate the best new buildings and developments across Kent over the past two years. During the evening, eight bespoke awards, specially designed and created by local artist, Dan Stafford, were presented during the ceremony at the Marlowe Theatre, Canterbury. 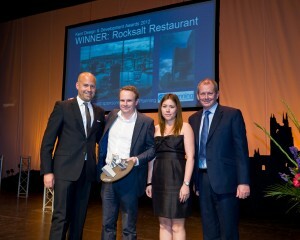 The award for ‘Overall Winner’, which was voted for by the audience live on the night, was picked up by the Rocksalt Restaurant, Folkestone. “I am honoured to win this award. 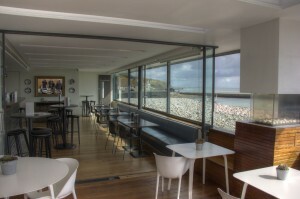 The Rocksalt Restaurant sits snugly in the curve of Folkestone harbour, and all the glass gives people a wonderful view of the sea – which was our biggest influence for the design. The winners of the remaining categories were chosen by a panel of judges from widely-respected industry bodies, including the Royal Institute of British Architects (RIBA) and the Royal Institute of Chartered Surveyors (RICS). Amongst these winners was the Turner Contemporary, which picked up the award for Community Public Buildings, and the Hadlow College Rural Regeneration Centre, which was given the award for ‘Environmental Performance’. The full list of award winners can be found below. “Good design and quality developments are essential if we are to continue to maximise on the attractiveness and uniqueness of Kent. “The calibre of entries was extremely high this year. The quality and skill that went into these buildings and developments is truly outstanding, and they all deserve to be celebrated. Awards picture: from left to right: Josh de Haan – Co-owner of Rocksalt Restaurant, Michelle Earnshaw – Architect at Guy Hollaway Architects, Guy Hollaway – Owner of Guy Hollaway Architects, and David Hicken – Managing Director of DHA Planning (Sponsor). Interior shot of Rocksalt Restuarant.